Duisburg. On 5 November, the feasibility study „Perspectives for the use of hydrogen as fuel in inland navigation“ was officially handed over at the Verein für europäische Binnenschifffahrt und Wasserstraßen e.V. in Duisburg. The study was developed as part of the German-Dutch cooperation project MariGreen under the lead management of RWTH Aachen University and presented to the clients MARIKO GmbH and FME by Sören Tinz from the Department of Internal Combustion Engines at RWTH Aachen University. In addition to RWTH Aachen, a total of seven project partners were involved. These include the DST Development Centre for Ship Technology and Transport Systems, abh INGENIEUR-TECHNIK GmbH, Electric Ship Facilities BV (ESF), Delft University of Technology, Eindhoven University of Technology, Emden/Leer University of Applied Sciences, Department of Maritime Studies and the Association for European Inland Navigation and Waterways. The development trends and perspectives of the use of hydrogen in inland navigation were identified. 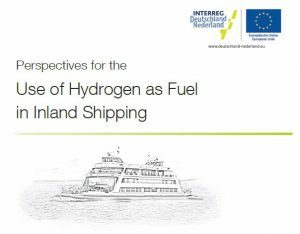 While the use of hydrogen is not yet economical for ship operators due to several factors, since the costs for regenerative hydrogen production as well as for ship conversion are considerable, the study underlines the basic technical feasibility in many areas of inland navigation. This assessment is based on analyses of the existing and future hydrogen infrastructure, various storage technologies and energy conversion in fuel cells and combustion engines. This is presented exemplarily for four inland waterway vessel types (cargo vessel, push barge, Rhine ferry and a cabin/passenger vessel). A further component of the study is the special requirements for training and education measures in dealing with various hydrogen technologies. In addition, the legal situation for the use of hydrogen as a fuel is analysed and recommendations for action are formulated. In order to overcome the entry barriers on the way to the use of hydrogen as a fuel in inland navigation, the study strongly recommends the initiation, development and promotion of demonstration projects that provide practical proof of technical feasibility. The MariGreen project is coordinated by Lead Partner MARIKO GmbH in Leer. The project is funded via the Ems Dollart Region of the European Union’s INTERREG program.